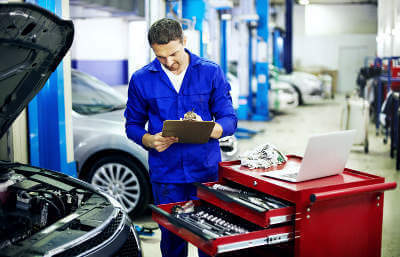 If your MoT test is coming up you’ll want to pass it with flying colours, that’s why we’ve decided to put together a handy list of top tips that will help you ace your way through the test. Most car owners dread the thought of the MoT test and it can often cause stress when the time comes. Even though the test can cause a lot of hassle it’s a legal requirement and it’s also a great way of giving your car a thorough health check on the most important parts of the car. Most testers will let you know if you need to look at something in your car in the next few months. The new MoT test also has categories that will enable you to see everything that’s ‘amber’ and might need attention in the next few months/weeks and the ‘green’ will show all the passed areas and ‘red’ will show failed areas if there are any. Hopefully, with our handy guide, you’ll avoid failing the MoT test on the smaller easy fixes. These are the most common things cars in the UK fail their MoT test on. Lights- This has been the most common failure in MoT test over the last few years and it’s the most basic check that anyone can do. It’s best to check them when you have someone with you so you can brake, reverse and put on the hazards and the other person can walk around the vehicle to ensure they are all in working order, this would take 2 minutes to complete and could be the difference between a pass and a fail. Windscreen - Take a look for any cracks and try to have them repaired, there isn’t really a clear line where they can fail the car but if the windscreen has justified damage that affects the driver's view of the road then it can fail. Most small cracks will come under the minor category. Brakes - You will know if your brakes need changed, estimate how many miles you’ve travelled since your last brake pad change. Look out for the obvious signs of spongy brake pads or squealing noises when you brake. Tyres - Have a look around all four tyres, check the tread depth using the 20p test and make sure the tyres have plenty of tread, the legal limit is 1.6mm! Horn - This is a simple one, but if your car horn isn’t functioning correctly this can lead to a fail. If the horn is working but fading it will result as a minor fault and if it’s not working at all it will result in a MoT fail. Seatbelts - Just check all your seatbelts clip in and check there is no damage, a top tip is to arrive at the MoT test with the seatbelts already clipped in so the tester doesn't have to go around each seat. They may check them anyway but it might just save the tester a bit of time. Mirrors - All mirrors should be secure, if your wing mirror is broken it will mean the car won’t pass the MoT, make sure they in a visible condition i.e. no cracks. Reg Plate - Check that the reg number is clean and in good condition and if your car has a personalised number plate then you’ll need to ensure it meets all the requirements. If your car is due its MoT test then MyCarNeedsA.com can get you quotes from MoT approved garages in your area. If you need some help in terms of getting your car ready for the MoT test our garages could carry out a VHC (Vehicle Health Check) or carry out a service and MoT to check over your car before putting it to the test. Check out the full guide of MoT test on the official government website.